How do I make an eProduct? The particular product you are selling may be digital in nature rather than a physical product. 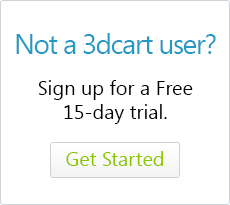 If you're selling digital downloads, you would use the 3dcart eProduct functionality. This is a function in which you create an item in your store that is downloaded rather than shipped to the customer after purchase. For example, your general products may be exercise products such as workout clothing or equipment but you also offer diet cookbooks as downloaded e-books. For this type of situation, you would use an eProduct. To begin using eProducts, you will need to enable the eProduct Module in your 3dcart store. You may do this by taking the following steps. Use the search bar at the top to search for and open the eProducts module. Click "Save" at the top right to complete enabling the module. Mark this checkbox if you'd like for your customer to log into their customer record on your store in order to download the eProduct. This field can be used to set the number of days that an eProduct link will be active for. The limit is based on the number of days after the date of purchase. *Having the eProduct download link generated after the order is in a specific status will also process the link generation in background processes (rather than at the time of purchase). This will help in situations where you might have a large volume of eProduct orders that could potentially slow down your store as the links are generated immediately upon purchase. After you configure these settings, click "Save" on the settings window to finish setting them up. Once you have an eProduct specified and uploaded to your store, you will use the eProduct Tab in the product's listing to specify the path to your item. Proceed to the product's "eProduct" tab. Select the eProduct and click the "Save" button. Although designed to work with files uploaded to your local store server, you can also specify external URLs if your product files are located elsewhere. Now you will be given the option of adding special instructions to the eProduct. These can be special information to the customer letting them know how to download the product after purchase or any special instructions they may need to open/view the file. You can also use this screen to manage and assign serial keys to your eProduct as needed. Adding Products: What are eProducts? How do I assign Serial Numbers to my eProducts?